Sabarmati River Basin flows in the mid-southern part of Rajasthan and some parts of Gujarat, between latitudes 23 degree 25'; and 24 degree 55'; and longitudes 73 degree 00'; and 73 degree 48';. The river extends over some parts of Udaipur, Sirohi, Pali and Sabarmati River Dungarpur Districts. Sabarmati River flows in a southwesterly direction. Ahmedabad and Gandhinagar are located on the banks of the river. There is a legend of how Sultan Ahmed Shah was inspired to establish Ahmedabad. It is said that while he was resting on the bank of Sabarmati River he got inspired by the courage of a rabbit to chase a bully dog. On the banks of the river Sabarmati, Gandhiji established Sabarmati Ashram during India's Struggle for Independence. 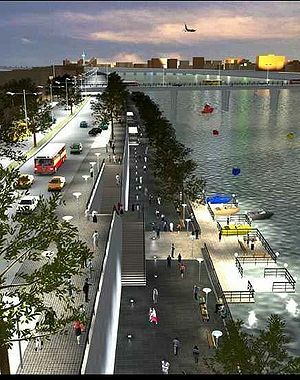 The Sabarmati Riverfront Development Project is an initiative by the Ahmedabad Municipal Corporation to develop the Sabarmati riverfront in the city of Ahmedabad, India. 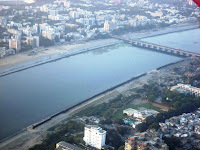 In May 1997, the Ahmedabad Municipal Corporation established the Sabarmati River Front Development Corporation Limited (SRFDCL) under Section 149 (3) of the Companies Act 1956. The SRFDCL was provided with seed capital of Rs. one crore and charged with the responsibility of developing the Sabarmati Riverfront. Project is undertaken with a prime objective of environmental improvement and provision of housing for the poor who living in life threatening conditions along river bed. The project has been planned as a self-financing project. The revenues would be generated from the sale of proclaimed land. Rs. 1,200 crore (US$ 255.6 million) project includes Walkway development, Road development along River, Promenades, Garden, Construction of 4000 houses under slum rehabilitation, Amusement Park, Golf Course, Water Sports park and Construction of Kotarpur Weir.